Although I've been interested in my home town's history for decades now, I still get confused sometimes about what happened when. So, I finally decided to make a list of as many significant events as I could think of, and put them all in chronological order. I must say, I wish I'd done this a long time ago! It makes things much easier to understand and remember. Most of the information presented here was gleaned from Donald H. Pflueger's "Covina: Sunflowers, Citrus, Subdivisions," Castle Press, Pasadena, 1964; Dr. Barbara Ann Hall's "Images of America: Covina," Arcadia Publishing, 2007; the West Covina Historical Milestones webpage; and online communications with fellow Covina-area historians Glenn Reed, Randall Smith, Tom Armbruster and Jim Harris. Other references are provided in links. Please bear in mind: this timeline is an ongoing work-in-progress. Corrections, additions, and their supporting documentation are welcomed. July 30, 1769 – Explorers led by Gaspar de Portolá are the first Europeans to set foot in today's San Gabriel Valley. To cross a boggy creek, they construct a makeshift bridge ("puente"), thus bestowing the first Spanish place-name on their new discovery. September 8, 1771 – Hispanic settlement of what will become Los Angeles County commences with the founding of Mission San Gabriel Arcángel in the province of Las Californias in New Spain. First built on the bank of the Rio Hondo near today's Whittier Narrows, the mission moves to its present location after a flood in 1776. September 4, 1781 – The founding of El Pueblo de Nuestra Señora la Reina de los Ángeles. 1804 – Las Californias is divided into two new provinces: Alta California and Baja California. 1819 – The friars of Mission San Gabriel build a supply station and chapel 45 miles to the east. In the decades to come, a trail that connected the two Catholic outposts will become an important pioneer transportation link called the San Bernardino Road. November 25, 1826 – Jedediah Smith is the first U.S. citizen to venture by land into the valley of the San Gabriel. His party camps at Mud Springs, located in today's San Dimas, just south of the intersection of Bonita and Walnut Avenues. November 5, 1841 – The Rowland-Workman Party arrives in Los Angeles from New Mexico via the Old Spanish Trail. The 65-member emigrant caravan comprises multiple nationalities, including Americans, Mexicans and Europeans. March, 1842 – Alta California Governor Juan Bautista Alvarado grants Rancho La Puente to American-born Mexican citizen John A. Rowland. The grant holdings comprise 76 square miles of prime range land east of the San Gabriel River and south of the San Bernardino Road. July, 1845 – Governor Pío Pico grants co-ownership of Rancho La Puente to Rowland's fellow settler and business partner, British-born Mexican citizen William Workman. April 24, 1846 – The beginning of the Mexican-American War. Rancho owners Rowland and Workman both participate in military actions in southwestern Alta California. January 10, 1847 – Los Angeles falls to American forces following the Battle of Rio San Gabriel. February 2, 1848 – The war ends with the signing of the Treaty of Guadalupe Hidalgo, which cedes Alta California to the United States. Under its terms, Rowland and Workman retain ownership of Rancho La Puente, and Rowland regains his U.S. citizenship. 1849-1850 – The first American settlement in the San Gabriel Valley is founded at El Monte, on the Old Spanish Trail just east of the Rio Hondo. September 9, 1850 – California becomes the 31st State in the Union. 1854 – The first orange trees are planted in Rancho La Puente. 1858 – The U.S. Government declares most of British Crown subject Henry Dalton's Rancho Azusa to be public land. During the following two decades, hundreds of American squatters/homesteaders will move into the area which today comprises the cities of Baldwin Park, Glendora, Irwindale, and the northern half of Covina. 1863-1864 – A severe drought decimates the region's cattle industry, and the ranchos of Los Angeles County turn increasingly to agriculture and land sales to survive. 1865 – The first general store and post office in the Azusa Valley is built at "Four Corners" ("Las Cuatro Esquinas"), on the north side of the San Bernardino Road where it intersected the Azusa Cañon Road, just west of today's Orange Avenue. Orange trees are also planted there. 1866 – William Rubottom founds the town of Spadra: the first American settlement in Los Angeles County located east of the San Gabriel River. 1868 – Rowland and Workman agree to partition Rancho La Puente; Rowland becomes the sole owner of the land which will later become Covina. c.1870 – A community center, Grange Hall, is erected on the south side of the San Bernardino Road just west of today's Vincent Avenue. The gathering place is also used for church services and a school. October 13, 1873 – "Don Juan" Rowland dies. May 17, 1876 – "Don Julian" Workman kills himself following the failure of the Temple & Workman Bank and the subsequent forfeiture of his portion of Rancho La Puente to E. J. "Lucky" Baldwin. September 2, 1876 – Costa Ricans José Julián Badilla and Father Pedro Maria Badilla purchase 5,563 acres of Rancho La Puente from widow Charlotte Rowland for $45,000, where the family intends to start a coffee plantation. Brothers Julián and Pedro Antonio Badilla subsequently build two frame houses on the San Bernardino Road near the southwest corner of its intersection with today's Hollenbeck Avenue. September 5, 1876 – The Southern Pacific Railroad completes its new line connecting Los Angeles to San Francisco and the transcontinental railway system beyond. The S.P. 's right-of-way does pass through Rancho La Puente, but to the south of the San Jose Hills, bypassing the Azusa Valley. Fall, 1876 – Lower Azusa School – the first dedicated schoolhouse in what will become the Covina area – opens for classes at the southwest corner of Cypress Street and Azusa Street (now Lark Ellen Avenue). 1877 – Eugene C. Griswold builds a general store and meeting hall at the northeast corner of today's Citrus Avenue and Cypress Street, which also becomes the Covina area's first post office. Griswold's pioneer settlement is named "Citrus." The store closes in 1879, but Griswold's Hall remains the local post office until 1886. 1878 – The Badilla coffee plantation fails. Julián moves his family to Mexico, then later to Arizona. Antonio remains on the Azusa Valley plantation and borrows money to try growing other crops, but ultimately, that enterprise fails, as well. 1879 – Antonio Badilla defaults on his bank loan, and John E. Hollenbeck buys the plantation at the foreclosure sale for $16,692. He subsequently gifts 100 acres back to Badilla so he can keep his house and have some land to farm. 1880s – The cultivation of wheat, barley, and grapes dominates agriculture in Rancho La Puente. 1882 – Joseph Swift Phillips (born 1840) buys a 2,000-acre portion of the former Badilla lands south of the San Bernardino Road from J. E. Hollenbeck for $30,000. Phillips and his family take up residence in the Julián Badilla house. 1883-1884 – Future Los Angeles mayor Frederick Eaton surveys the 2,000-acre Phillips Tract, and names the tract's townsite "Covina." Eaton also names one of the main streets "Badillo," misspelling the land's previous owners' surname. December, 1883 – Covina's first schoolhouse – the Phillips School – opens at the southeast corner of San Bernardino Road and Citrus Avenue. Early 1884 – Joseph Moxley buys the first parcel of land in the Phillips Tract – 20 acres at the southwest corner of San Bernardino Road and Barranca Street – and builds the tract's first residence. December 12, 1884 – Newspaperman H. N. Short and associate J. R. Conlee arrive in Covina to start The Covina Independent, and soon after erect the new townsite's first structure – their print shop – at the southwest corner of Citrus and Badillo. December 24, 1884 – The Covina Social Club opens a community center on East Badillo Street, appropriately named Covina Hall. It also serves as the town's first church. January, 1885 – The Phillips Tract officially opens for land sales, The Covina Independent publishes its first edition, and Covina's first general store is built by F. E. Grover at the northeast corner of Citrus and Badillo. A blacksmith shop, butcher shop, and grocery soon follow. 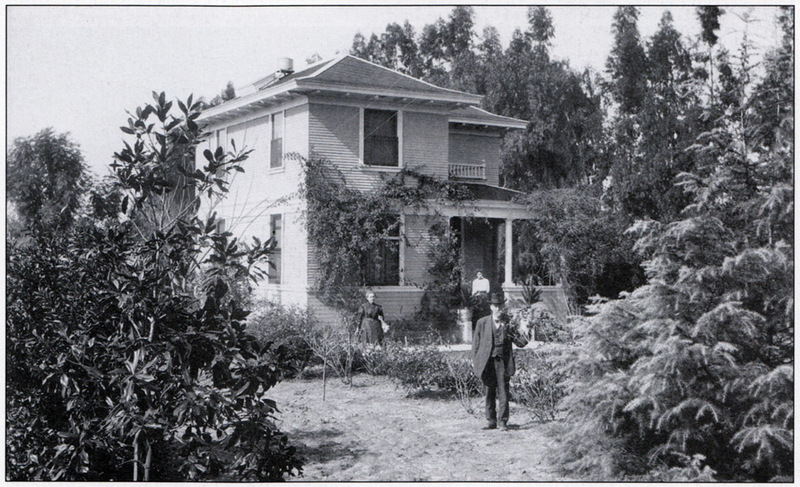 1885 – Samuel Allison builds the first residence in the Covina townsite at 160 West Badillo Street. Newspaper editor Conlee's house goes up soon after at 202 West College Street. 1886 – Thomas Sanderson Ruddock builds the Azusa Valley's first mansion – Mountain View – on former Badilla/Hollenbeck lands to the immediate east of the Phillips Tract. On the 120-acre estate are planted 9,000 orange and 3,000 lemon trees. Fall, 1886 – J. R. Hodges builds Covina's first permanent structure out of concrete on the south side of Badillo Street east of the Pioneer Blacksmith Shop. 1887 – Covina's first telephone is installed in Hodges' "Concrete Block." c.1888 – Dr. A. B. Hostetler becomes Covina's first resident physician. Early 1890s – Large orchards of deciduous and citrus fruit trees begin replacing the grain fields and grape orchards of the Eighties. 1891 – The Citrus Union High School District is formed to jointly serve the communities of Azusa, Covina and Glendora. Citrus Union's first classes are held that September in an abandoned hotel in the defunct settlement of "Gladstone" north of Covina. August, 1893 – Area orange growers form the Azusa-Covina-Glendora Citrus Association. Several small packing houses are opened along the Santa Fe rail line through Azusa and Glendora. Lemon growers form a similar association in 1895. 1894 – Two new Grammar Schools are constructed in Covina: one on Citrus at San Bernardino Road, and the Lark Ellen School, which replaces the old Lower Azusa School on Cypress Street. Charter Oak also opens its own schoolhouse at the southwest corner of Bonnie Cove and Cienega Avenues. Late 1890s – Citrus cultivation steadily grows to become the dominant form of agriculture in the Covina area. 1895 – The Pomona Road (today's Covina Hills Road) is completed over the eastern San Jose Hills, and Azusa Avenue becomes the first paved street in the Phillips Tract. October 10, 1895 – The town's first bank opens: a Covina branch of the Azusa Valley Bank. October 14, 1895 – The Covina Citrus Association is incorporated. December, 1895 – The Houser Bros. packing house – Covina's first large-scale citrus processing operation – is erected alongside the new Southern Pacific rail line. 1896 – The Covina City School District is formed. 1896-post WWII – With its own citrus industry, rail transportation links, schools and financial institutions now established, Covina's future is assured, and its first boom begins. The "Era of Citrus" will span the next half-century. 1897 – The Chapman-Workman Building goes up at the northwest corner of Citrus Avenue and Badillo Street. Spring, 1897 – The Covina Reading Room and Library Association is formed. The first donation comprises 50 books. April, 1898 – Local investors headed by C. H. Ruddock buy the Covina branch of the Azusa Valley Bank and re-name it the Covina Valley Bank. In 1901, it becomes the First National Bank of Covina. October 11, 1898 – Seventeen ladies gather in the home of Mrs. J. J. Morgan and organize the Monday Afternoon Club, which subsequently incorporates as the Covina Woman's Club. 1899, 1901 – The headquarters of the First National Bank of Covina is constructed in stages at the northwest corner of Citrus Avenue and College Street. 1899 – Covina opens its own high school on the second floor of the newly-expanded 1894 Grammar School. Lillian Harris is the first graduate of Covina High in Spring, 1900. 1900 – The Reed Block is erected at the northeast corner of Citrus and Badillo. August 11, 1900 – Covina's first hotel – The Vendome – opens at the northwest corner of Citrus and Cottage Drive. January 21, 1901 – The 20th century officially dawns in Covina with the arrival of electricity and electric lights. August 6, 1901 – Covina becomes an incorporated city. September, 1902 – The Covina Home Telephone Company is formed. By mid-1903, almost a hundred homes and businesses are connected to the network, and in October, 1903, long distance service to Los Angeles becomes available. 1902-1903 – Fifty electric street lights are installed in town. Forty-one more are added in 1908. January 5, 1903 – Classes begin in the new Covina High School building, located behind the Grammar School and facing San Bernardino Road. November 4, 1903 – The C. W. Tucker photographic studio opens for business. 1904 – A new home for the Covina Woman's Club is built at the northwest corner of Citrus Avenue and Center Street. 1904-1905 – Flood-prone Walnut Creek is channelized from Azusa Avenue west to the San Gabriel River, and Lucky Baldwin's 4th Subdivision in Rancho La Puente lays out the grid of streets of what will later become West Covina. October 28, 1905 – Covina founder Joseph Phillips dies. December 4, 1905 – Dedication of the new Carnegie Library at the southeast corner of Second Avenue and Italia Street. 1909 – Warner & Whitsel open their new two-storey brick grocery store on Citrus Avenue. The building is known to later generations of Covinans as Custer's. March 1, 1909 – The rancho period ends upon the death of Lucky Baldwin. March 30, 1909 – Dedication of the new Covina Union High School building at the northwest corner of Citrus and Puente Street. September, 1909 – West Covina opens its own schoolhouse near today's Sunset and Cameron Avenues. Eleven students are enrolled at Irwindale School in its first year. 1915 – The Citrus Union High School District opens Citrus College: the first public community college in Los Angeles County. 1915 – The new San Jose Hills Road (roughly following today's South Grand Avenue) gives Covinans a much more direct route to the Walnut Valley and on to Orange County. April, 1916 – The street clock in front of the Finch Brothers Jewelry Store on Citrus Avenue is installed. In 1925, it is upgraded to run on electricity. 1917 – Dedication of the Masonic Home on East Badillo Street in Charter Oak. 1919 – The fourth and last Covina Grammar School is constructed at Citrus and San Bernardino. The old high school building is moved to the southwest corner of Second Avenue and School Street, and is dedicated as the Covina Masonic Lodge that same year. May, 1921 – Ten acres of the Adams Tract west of Fourth Avenue are acquired for the development of Covina Park. The plunge opens 2 years later. December 19, 1921 – Opening night of the Covina Theater. "Bits of Life," starring Wesley Barry, Rockliffe Fellowes, and Lon Chaney, Sr., is the first film shown in the new motion picture venue. Summer, 1922 – Graduate nurses Melisse Wittler and Lavinia Graham open the city's first hospital in the former Charles E. Bemis home at the northwest corner of Badillo and Second Avenue. Soon after, sister Mary Wittler joins the partnership. February 23, 1923 – The residents of West Covina vote in favor of incorporation. Two days later, it is officially declared a city by the County Board of Supervisors. 1924 – Covina Hospital moves to a new facility at 275 West College Street. That same year, The Magan Clinic (founded in 1919) opens at 155 West College Street. 1925 – The California Preparatory School for Boys is built on the former H. M. Houser ranch in the Covina Hills, 1-1/2 miles southeast of town. Although academically acclaimed, Cal Prep becomes a casualty of World War II, and in 1942, the campus is sold to the Theosophical Society Point Loma. January 30, 1930 – Dedication of the new Covina City Hall on East College Street. 1935 – Four-lane Garvey Boulevard (U.S. Highway 99) is completed through the eastern San Gabriel Valley and over Kellogg Hill to Pomona. 1938 – The Voorhis School for Boys (est. 1928) – located on South Valley Center Avenue in the Covina Hills – becomes the southern campus of the California Polytechnic School. In 1956, it relocates to the nearby former W. K. Kellogg Arabian horse ranch, ultimately becoming today's Cal Poly Pomona. May, 1939 – The new United States Post Office is opened at the southwest corner of College Street and Second Avenue. 1945-1946 – The "quick decline" virus spreads through the orange groves, killing thousands of trees. The devastating blight heralds the beginning of the end of Covina's Era of Citrus. 1945-1955 – High demand for new suburban housing after World War II results in a shifting of the local economy from agriculture to residential real estate and construction, ushering in Covina's second boom. 1946 – The Wittler sisters agree to sell Covina Hospital to a group of 200 local citizens. The sale and expansion are completed in 1948, and the institution is renamed Covina Inter-Community Hospital. Fall, 1946 – Classes begin at Mount San Antonio College in Walnut, affording local high school graduates a stepping stone to higher education. March 28, 1947 – Citing competition from private automobiles, Pacific Electric ends its trolley service to Covina. 1951 – The California Baptist Theological Seminary opens at its campus on Covina Hills Road, occupying the former buildings of the California Preparatory School and Theosophical Society. The seminary ordains its last ministers in 1974. August 1, 1952 – The first stores of West Covina Center are opened on Garvey Boulevard just west of Glendora Avenue. 1953 – The Covina Grammar School on Citrus Avenue is closed, and in 1955, the building is sold to Aetron: a division of Aerojet-General Corporation. 1954-1955 – Construction of Shoppers Lane at the southeast corner of Citrus Avenue and Rowland Street. 1955-1956 – Construction of the original West Covina Plaza shopping center on Garvey Boulevard west of Vincent Avenue. 1956 – Covina High School moves to a new campus on Hollenbeck Avenue, and West Covina High School moves into the old Covina Union High School buildings until its own new campus opens for classes in 1957. Edgewood High School is the last to occupy the grounds during the 1958-1959 school year. 1956-1957 – The San Bernardino Freeway (later Interstate 10) is extended through the West Covina area, and is completed on April 26, 1957. February 11, 1956 – The Googie architecture jewel Covina Bowl opens. October 24-26, 1957 – Grand opening of the Eastland Shopping Center in West Covina. It is the sixth modern mall built in the Southland, and the first to be located adjacent to a freeway. August 27, 1958 – The Huddle restaurant in the Eastland Shopping Center – another Googie classic – serves its first customers. Fall, 1959 – Classes begin at the new Northview High School at Azusa Avenue and Cypress Street, at Charter Oak High School on East Covina Boulevard, and at Edgewood High School at Merced and Orange Avenues in West Covina. c.1960 – Suburban homes now greatly outnumber orange groves. Covina's Era of Citrus has ended. 1960 – The Covina Woman's Club breaks ground for its new clubhouse at 128 South San Jose Avenue. October 14, 1960 – 30,000 people gather to hear Vice President Richard Nixon deliver a campaign speech at Eastland. 1961 – The abandoned Covina Union High School's main building on Citrus Avenue is gutted in an arson fire, and the entire campus is subsequently razed. 1961 – Controversy surrounds plans by Forest Lawn to open an 1,100-acre cemetery in the Covina Hills. The protest demonstrations attract national news coverage. 1961 – The Wonder Fair department store on Barranca Street opposite Eastland, White Front on North Azusa Avenue in Covina, and SCOA on West Cameron Avenue in West Covina introduce the convenience of "big box" retail to local shoppers. November 15, 1961 – The gala premiere of the Eastland Theatre at 2504 East Workman Avenue in West Covina. It is the first area movie theater to feature stereo sound. 1962 – The historic Badilla/Phillips house at San Bernardino Road and Hollenbeck Avenue is burned down in a fire department training exercise. 1962 – In West Covina, The Broadway and Desmond's are the first stores in the city's new Fashion Plaza, the Los Angeles County Public Library opens a new branch at 1601 West Service Avenue, and Queen of the Valley Hospital is founded. 1963 – The present Covina Public Library is constructed on the site of the old Carnegie Library on Second Avenue. June 19, 1963 – The Capri Theatre opens at 444 South Glendora Avenue in West Covina. 1964 – Grand Avenue is extended from Rowland Street south to Holt Avenue. Fall, 1964 – Classes begin at the new South Hills High School at Barranca Street and Cameron Avenue in West Covina. Fall, 1965 – Classes begin at the new Royal Oak High School at East Badillo Street and Glendora Avenue in Charter Oak. September 7, 1965 – The Carousel Theatre opens at 3213 East Garvey Avenue in West Covina. Although it plays host to many big-name musical acts and shows, its location and "theatre in the round" stage design prove to be unpopular. It closes only 3 years later in December, 1968, and is demolished in February-March, 1969. November, 1965 – Montgomery Ward takes over the former Wonder Fair/ABC department store on Barranca Street in Covina. October 1, 1967 – The Magan Clinic opens its new main office on West Rowland Street just east of Hollenbeck Avenue. 1968-1969 – Azusa Avenue is extended south through the San Jose Hills from Francisquito Avenue in West Covina to Amar Road in La Puente. July 31, 1968 – Grand opening of the Sears store at the southeast corner of Azusa Avenue and Arrow Highway. 1969 – The former Covina Grammar School/Aetron building is razed to clear the site for a proposed new Civic Center, which is never built. That same year, however, West Covina constructs a new City Hall and Police Department headquarters on South Sunset Avenue. 1969 – The Covina Valley Historical Society is formed. June 27, 1969 – The Fox Covina Theatre opens at 221 North Azusa Avenue. August 20, 1969 – Opening of the Wescove Cinema 1 & 2 at 1450 West Service Avenue in West Covina: the first multi-screen indoor movie theater in the eastern San Gabriel Valley. 1969-1970 – A new alignment of Grand Avenue south from Cortez Street in West Covina bypasses meandering old San Jose Hills Road, offering drivers a much quicker and safer route to Mount San Antonio College. Cameron Avenue from Barranca Street to Grand Avenue is also improved and widened. September 25, 1975 – Following the demolition of the old open-air West Covina Plaza in 1974, a greatly-expanded West Covina Fashion Plaza re-opens as the area's first fully-enclosed indoor shopping mall. 1986 – Covina celebrates the centennial of its founding. November 6, 1988 – National politics returns to Covina when Vice President George H. W. Bush and U. S. Senator Pete Wilson address a campaign rally in Covina Park. 1989 – Construction is completed on the 13-storey Eastland Tower at 100 North Barranca Street in West Covina. Standing 158 feet above street level, it is the tallest building in the eastern San Gabriel Valley. 2001 – Covina celebrates its centennial as an incorporated city. May 7, 2003 – IKEA opens its new Covina location in the former Montgomery Ward building at the southeast corner of Barranca and Workman Streets. 2004 – The historic Covina Theater building is demolished to construct the Covina Center for the Performing Arts. The adjacent Reed Block (1900) is razed to complete the redevelopment in 2006. In an earlier post, I told of my search for the oldest building in Covina. That turned out to be 111 North Citrus. Constructed in 1885, it was one of the very first structures erected in pioneer-era Covina. So, what is the oldest residential structure in the Covina area? It's the historic Thomas Griswold House at 18430 East Covina Boulevard. It was originally located in brother Eugene Griswold's pioneer community of Citrus, at the southwest corner of Citrus Avenue and Cypress Street. According to Thos. Griswold's great-grandson, Jack Milliken, the deed for that property was recorded in September, 1885, so the house would likely have been built soon after. Mr. Milliken believes it was moved to its present location sometime in the 1940s. Photo by Jack Milliken, used with permission. 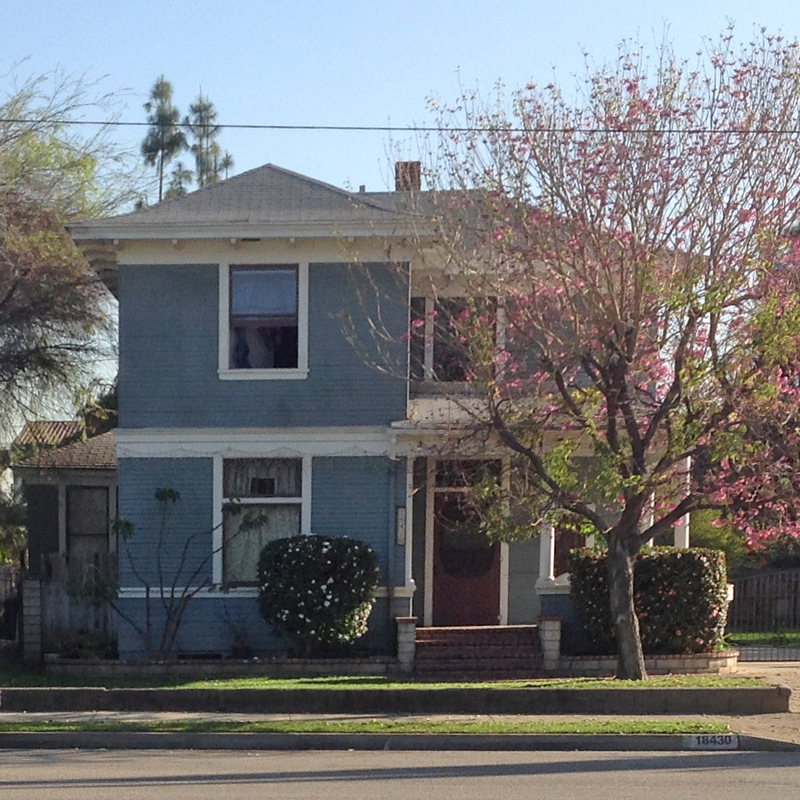 There are two homes from 1887 within the Covina city limits, but only the one at 16731 Cypress Street still looks like a 19th century house. Unfortunately, the remodeled one at 311 Italia Street just happens to be the oldest existing house located within the original Phillips Tract. Given that historical distinction, it's a real shame that it no longer looks anything like it must have when it was built. If you're curious to find out when a particular structure was constructed, that information can be found on the built:LA interactive property map. It can be a little difficult to locate things at first, because the streets are not labeled, but if you mouseover a particular property, it will show its address in a box in the upper left corner, and (in most cases) the year it was built.